Like all dating sites, not productive. Many players from married men to women just looking for free meals/entertainment, then the owner is like Hitler imposing his morality on everyone from a mandatory age restriction (instead of leaving it to the users discretion/choice what they will accept). For those that experience people they do not like? Remember, it is a "FREE" site, you weed out many fake and users on paid sites. Few married men will pay, user women will not wish to spend the cash. The you can filter, report, and block the rude individuals, and no "Markus" unrealistic and rude forced limitations. I filled out 1 profile even added pictures. I got the confirmation e-mail. When I tried to log in I couldn't access account and it said my e-mail address did not exist?! I filled out another very time consuming profile questionnaire with pics. Even sent messages to some women. I received e-mail confirmation. When I tried to access account again I couldn't and again it said my e-mail address does not exist! I sent several e-mails to POF customer care with no response at all. What gives with this site? Something is very wrong. What happened to all of my personal information, pictures, messages ?!! Useless- nobody even responded to any messages I sent, and I sent messages to a lot of women. 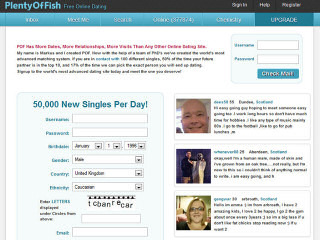 If someone can't even get somebody to talk to them online, what are the odds of getting a date through the same service? Also the guy who runs it, Markus, is a douche. You must input your income into your profile, you can't talk to anyone who isn't within a radius of 7 years of your age, that means nobody 7 years younger or older than you because he magically decided so. Apparently people who talk to others that age are only interested in one night stands, but it's fine to ask their income? Not to mention you can't question anything on this site less you face the almighty banhammer. Do yourself a favor and just avoid the drama- like go somewhere else to find women, not this place. I'm widower that was married to Filipina woman 31 years that has been on POF since 1/13/2013. I'm seeking only women that are Filipina for dating. POF doesn't listen to their customers at all or thoroughly read the profiles of men that only want to date Asian women, or other women that are not white at all. I have asked POF to only match me with Asian women, I also begged & pleaded with them also. I have called their so called customer service number & they have never bothered to answer me at all. I already filed a complaint about POF to the Better Business Bureau. I have tried to message my favorites & I was blocked on purpose. The dating site POF has deliberately & intentionally kept me from being matched with Asian women on purpose. I think they got the animal incorrect - should be called Plenty of Pigs. I've never seen a bigger bunch of "less desirable" people in one location. Lesson learned: if you are an attractive person that has your act together, stay out in the bars and social venues. If you are ugly, fat, considered a redneck, white trash or near scumbag, online dating is for you. My best friend met several interesting people on PoF. I like that you can get good functionality with free membership, and I don't mind looking at ads to keep the site running. I didn't realize PoF had forums--thanks for pointing that out as it does seem like a nice way to get started with the site. I signed up for an account a few years ago but never really used it, but I'm going to give it another try now. I gave up with pof a months ago, after creating 3 accounts and having them all wiped out within a matter of days. i don't know if its incompetence or that they are just real strict with security and get rid of accounts that are real. Whatever they should sort it out. For the times it did work I was impressed by the number of people there in my area.